It's time to say 'Goodbye to September 2015' and let's immediately discuss the weather during this month; It wasn't great. Especially the beginning of the month saw a some rainy and windy days, with the wind being so forceful that small boat traffic for diving and snorkeling was cancelled for a few days. Luckily the end of the month was better and we had a few nice and sunny days, although an occasional tropical shower was sometimes part of this as well. For September in general I would expect better weather though, so at best it was a mediocre September for Koh Samui standards. All month I was at home on the island, which is good, so I can spend time with the family. All of net month will be spend at home as well. There was the very well organized and enjoyable Kamalaya run this month and we visited a few restaurant, mostly small, local Thai restaurants. Let's look forward to the October 2015 version, the start of the month looks promising with nice weather ahead of us! A local news paper from Wellington in New Zealand reported that a man from Wellington, New Zealand is missing after visit to Koh Samui. For the original link to the article, please follow this link. According to the article the Koh Samui Tourist Police were unable to provide any details overnight. "Police are now making enquiries into the whereabouts of a Wellington man missing in Thailand whose teen daughter is pleading for help to find him. 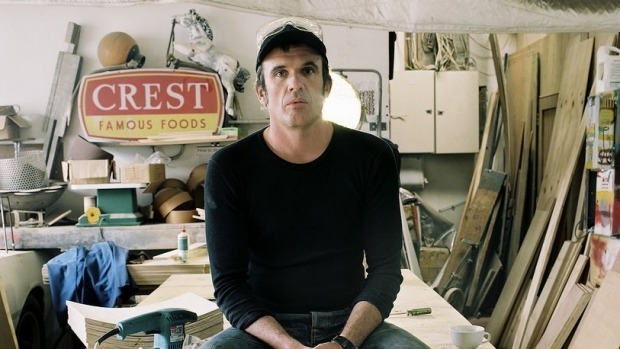 Andrew Missen, a designer who has created furniture for iconic Wellington eateries, failed to return to New Zealand after a trip to the Thai island of Ko Samui. His family hasn't heard from him for more than 10 days. "My dad, Andrew Missen, has gone missing in Ko Samui an island off Bangkok in Thailand. No one in our family has heard from him in over 10 days," she wrote. "He's supposed to have arrived back in New Zealand but he never arrived at the airport in Thailand. Attached is a photo of him, please please please share this for me, he's my best friend and we're all so worried." If you know anything about Andrew Missen or have seen him, contact his daughters Facebook page, her name is Teal Edwards-Missen or the local Tourist Police. The forecast is looking good for the next ten days with mostly partially clouded to sunny skies and possibly some rain net Sunday. From next Wednesday we should see very sunny skies. Recently we visit the sheep and hydroponics farm in Maenam on a regular base. The sheep farm is a great trip to make with your children in this very child friendly sheep farm! We mainly go for the hydroponics (a subset of hydroculture and is a method of growing plants using mineral nutrient solutions, in water, without soil. Terrestrial plants may be grown with their roots in the mineral nutrient solution only, or in an inert medium, such as perlite or gravel) and buy various sorts of green salad! The sheep farm has obviously a few sheep running around, but also a few goats and some rabbits. For children a great day out, with plenty of opportunities to interact with the animals, feed them and play at the various playgrounds at site. The sheep farm is literally surrounded by hydroponics, the main attraction for us. Currently one kilo of mixed salad greens or hydroponic produce costs as little as 120.-THB. A very good deal indeed and we can make 3 large salads out of this. Which we do on a regular base now. A healthy food choice as well! When you wander through the hydroponics part it almost feels as the greenhouses in the Netherlands but without the glass. There's also a restaurant on the premises at the sheep and hydroponics farm in Maenam, where you can order drinks and various great salads. It's a nice place to kick back, relax and keep an eye out on the kids or the young ones can play with toys and a small playground at the restaurant. The restaurant can also be used for birthday parties of your little ones! The prices are very decent, 40.-THB for a child and 80.-THB for an adult to visit the sheep and other animals and use the facilities and playground within the farm grounds. The location of the sheep and hydroponics farm in Maenam is fairly easy to find, at the traffic lights in Maenam at Soi 4, turn away from the ocean, towards Wat Maenam and just before the Wat or temple entrance, you hang a left and follow the road until you arrive at the sheep farm after about a kilometer at most. There are excellent posts along the side of the road, guiding you to the sheep farm. Very easy to follow. Once you find this, you can find your way back to the main ring road via various different ways that lead to Maenam Soi 3 and 2. There's even a small Dutch touch to the sheep farm! Visit the sheep and hydroponics farm in Maenam Facebook page for additional information. It comes highly recommended by me and it's a great day out with and for the kids! On top of Khow Tanim, the mountain near Baan Namuang, you can see two statues that resemble the statues at the Magic Garden. There's no signage or anything but since they're on opposite sides of the road, it almost looks like a gateway to the Magic Garden. The forecast shows the last bits of wind for today, as of tomorrow we should have partially clouded skies and mostly dry days with some serious sunny days after next weekend. The forecast is looking fairly good for the net ten days, a mi of cloudy and sunny skies with occasionally (hopefully) an evening shower tomorrow and next weekend. The forecast is looking good, still some clouds and a breeze tomorrow but after that it should be nice and sunnier with possibly some rain net Sunday. The forecast keeps changing almost on a daily base at the moment, a nice breeze can be expected until Wednesday, mixed with sunny moment, cloudy skies and occasionally some rain. after that it should be sunnier and next weekend there may be some rain again. WE'll see how this will pan out. The forecast looks good, mostly sunny skies, possibly with some clouds and a nice breeze until after the weekend. During the weekend there may eb a shower but other than that it looks like there will be no rain. Due to a computer problem yesterday, there was no update yesterday. So here we go today! The forecast predicts an increase in wind until Tuesday with clouds and possibly some rain, after that it should ease up a little. Yesterday my computer was down all day long (it's already 24th September now), hence there was no update. Please check today's update, to be published soon. "The 2015 Southeast Asian haze is part of the Southeast Asian haze-series (2005-2015), a longterm crisis better source needed] which happens roughly every 2 years in summer and fall. The 2015 event is affecting several countries in Southeast Asia, including Brunei, Indonesia (especially the islands of Sumatra and Kalimantan), Malaysia, Singapore and Southern Thailand. It is caused by forest fires due to the combination of illegal slash-and-burn practices and annual dry season in the Indonesian provinces of Riau, Jambi, South Sumatra, West Kalimantan, Central Kalimantan and South Kalimantan." The forecast changed drastically overnight. Cloudy days are back and wind and rain can be expected from Thursday evening onward until Monday night. It looked so promising yesterday but it's gone all to smithereens again. The forecast is looking for the next ten days with mostly sunny days and a very rare occasional shower. Juts got back from my long slow Sunday morning run. The forecast is looking good for the next ten days, occasionally a bit of a breeze and plenty of sunny skies coming our way! The forecast is looking bright, the next ten days should be a fairly sunny and there's not a lot of rain predicted, so enjoy! Time to hit the beaches again. The forecast shows that tropical storm Vamco has passed and better weather patterns can be expected soon. Tomorrow may still see some rain but Sunday should see a return of sunnier skies and next weekend should be really nice and sunny. Yesterday saw a heavily clouded sky all day long over Koh Samui, with strong wind and rain showers shortly before noon and around 6pm. Since Monday no dive and/or snorkel boats have been going out, but the ferries between Koh Samui - Koh Phangan - Koh Tao and Koh Samui and the mainland have not been interrupted. Max temp reached 28C, nice and cool. The forecast predicts the wind and rain of tropical storm Vamco to wind down tomorrow and come Sunday we may get the first sunbeams again, with hot and sunny days come the weekend after that. Time to start looking for that sun lotion again. The forecast sees tropical storm Vamco slowly easing up tomorrow and come Friday the wind should be more or less gone. After this weekend we can expect the sun to return. The forecast predicts of very strong wind and rain, a result of the tropical storm Vamco, and Samui will have to endure the fall out. Over the weekend it will clear up again, the wind will slow down and we get some sunshine back. 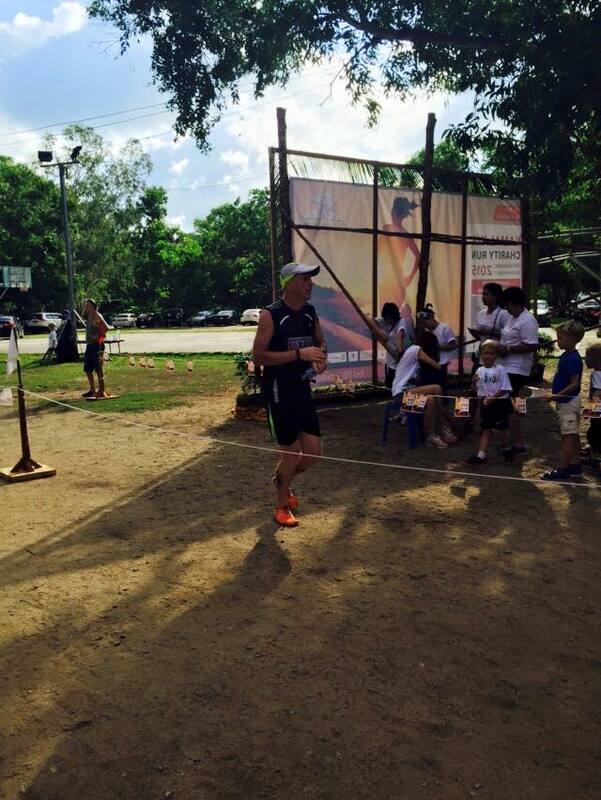 Yesterday the first Kamalaya Charity run took place at the Baan Namuang sports stadium. We were lucky with the weather, it was partially cloudy and actually very hot and humid. This didn't make the running any easier! The race was very well organized, with around 500 participants it was nice and not too crowded and the organizers thought of everything, like drinks, food after the race, including cold, fresh coconuts, toilets and even kilometer markers at the race. At the route there was almost no traffic, in this Southern part of the island and the one time we crossed onto the main road, police officers had everything under control. There were also enough water stations along the route, which was needed with this humid and hot weather. The 10km route was also very hilly, a real challenge. I am recovering from a hamstring injury and couldn't run at full throttle but still managed a 54'56.9 time over 10.13km, which I was happy with, considering the circumstances, I was most pleased that my hamstring held through. In typical Thai fashion though, the start was delayed by 18 minutes, in my opinion the only minor downside on this otherwise great race. It was a good event and I do hope the Kamalaya Resort will keep this event on Koh Samui's race calendar for the coming years. It's good to run in a different part of the island and as I already mentioned at the beginning of this blog post, it was well organized. The forecast predicts a very strong wind over the next three days and rain over the next four days. Next weekend it start to ease up again and after next weekend we may have a couple of sunny days coming up. 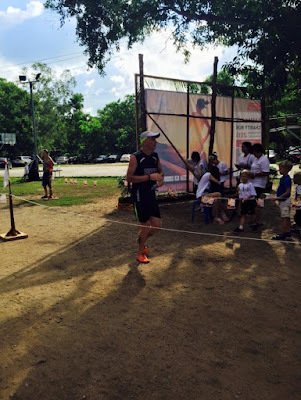 A very late update this morning due to me participating in the Kamalaya Charity run early this morning. A very nice and well organized running event. The forecast didn't change that much, Tuesday through Thursday strong wind and lots of rain and next Sunday it should clear up again. Don't forget the 1st Kamalaya charity run at the Namuang stadium tomorrow with a 7am start. The forecast predicts an easing up of the clouds over the weekend but as Monday wind and clouds move in again. Between Wednesday and Friday expect very strong wind with lots of rain and next weekend things should be a lot nicer again. 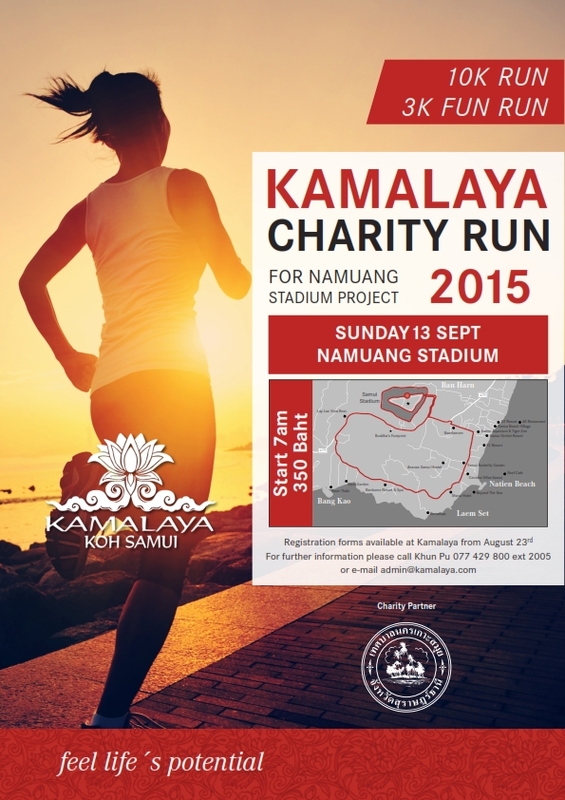 The Kamalaya Charity Run is coming up Sunday 13th September, that is this coming Sunday! At 7am at the Namuang stadium in Baan Namuang, the start will take place for the 10km run and ten minutes later the 3km fun run will take place. You can still sign up from 6am onward at the start location this Sunday and the participation fee is 350.-THB which will give you a t-shirt, a finishers medal in each category. The 10km race is a challenging route, with some , party steep hilly parts in it and with some great views. Looking forward seeing you there this coming Sunday. Due to a hamstring injury, I will only participate in the 3km fun run. The forecast shows mainly clouded skies, although there will be a few sunny moments, possibly over the weekend and early next week. Mid next week there's strong wind and rain predicted. This is near Bang Po and just behind the green is the ocean. It's becoming more and more difficult around Koh Samui to find direct access to beaches, since most of the Samui coast line is already fully build, thus preventing direct access to the public beaches. The forecast remains more or less the same as yesterday, more clouds coming Koh Samui's way over the next ten days with rain tomorrow and on Friday. After the weekend the wind will pick up and there's a lot more chance of rain. The forecast has changed again a bit and unfortunately not for the better. The next ten days should be mostly cloudy with an increase in wind blowing in and Thursday may see some hard late afternoon rain. After the weekend the ind should increase even a bit more and as of next Tuesday we may see a fair bit of rain. The forecast has changed overnight and the next ten days we can expect stronger winds coming Samui ways, with rain on Wednesday and Thursday and cloudy skies as of Wednesday. Today and tomorrow it should still be sunny. The forecast is looking good for the next ten days, sunnier skies are coming our way with occasionally a nice breeze and/or a tropical shower. The forecast predicts sunnier skies after the weekend until next weekend with an increase in wind and an occasional tropical shower. The forecast predicts a bit more sunshine after the weekend but the wind will also pick a little bit. The forecast predicts more sunny days, especially after the weekend and a remote change of a tropical shower. The forecast looks a lot nicer compared to previous days, there will be a lot more sunshine coming our way over the next ten days and chances of tropical showers have almost completely gone. Enjoy this batch of nice weather that's coming up! Indeed, welcome to September 2015 under a cloud cover. Not the typical September weather that one would expect to reign over Koh Samui at this time of the year, but the 2015 version of August was also out of sync this year compared to most other recorded years by me. A typical September would be an extension of the nice and sunny weather that August has, but the forecast for the first tend days of this month are not looking too hopeful. We may have some sunshine coming our way but it's mainly cloud cover that's predicted, including occasional tropical showers. One thing I'm looking forward to this month will be the Kamalaya charity run this coming 13th September, a Sunday, at the Namuang stadium. See you there! The forecast for the next ten days is mostly cloudy with chances of tropical showers and after next weekend an increase in wind.